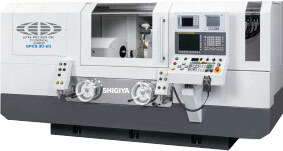 The GPV-10-20 vertical CNC grinder – with polygon grinding capability. The GPV-10-20 has all of the features as the GPV-10 such as a compact footprint of 1 square meter to accommodate a range of production line layouts, easy loading and automation, a direct drive wheel head for better accuracy, and extreme reliability. The New GPV-10-20’s direct drive motor is more powerful to facilitate polygon grinding, and features the Fanuc 30i controller allowing C-axis control for both polygon and eccentric pin grinding.